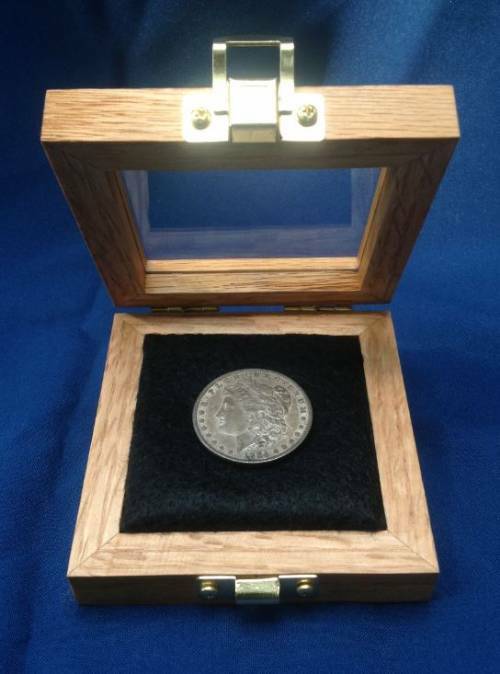 Coin Display Case - 4" x 4"
Solid wood coin display box size 4" x 4" x 1 1/4" exterior. Interior measures 3" x 3" x 1/4" . Solid Oak Wood Construction. This box features a glass front and foam insert with your choice of felt backing colors (blue, black, green, burgundy, or red). Brass plated hinges and a small front latch. Perfect size to display your silver dollar or your challenge coin. Please choose style below.